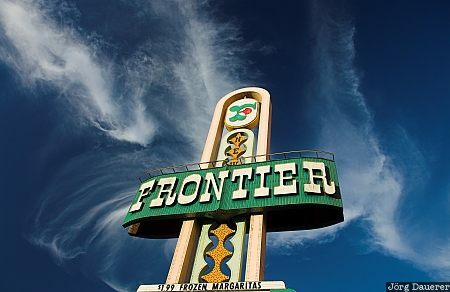 Sign of New Frontier Casino in Las Vegas in front of a blue sky with some clouds. Las Vegas is in southern Nevada, United States. This photo was taken on a sunny afternoon in late October of 2006. This photo is part of the exhibition White Clouds (February 2012). This photo was taken with a digital camera.